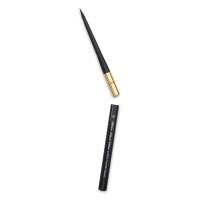 A polished black ferrule crimps the hair and is fitted to a gloss black handle. Enjoy a wonderful range of styles and sizes. 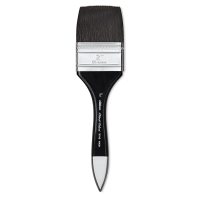 Black Velvet Watercolor Brushes, Set of 3 — This set contains one Series 3007 Script Liner size 1, one Series 3009 Oval Wash size 3/4", and one Series 3000 Round size 8. 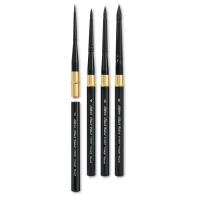 Black Velvet Voyage Travel Brushes, Set of 4 — This set contains four Round brushes, one each of size 2, 4, 6, and 8. The brush heads can be removed and inserted into the handles for storage. The brushes measure 4-5/16" long when closed.